See Galit and Jacqueline’s bios by clicking here. Graduate Assistantships offer great opportunities to grow as a teacher, improve your leadership skills, and usually comes with a tuition waiver and/or stipend. Seek adjunct teaching positions at institutions of higher education while you work through graduate school: music appreciation, beginner theory, applied lessons, online teaching, anything you can find. This is true after you graduate, too. Summer camps and honor bands offer employment opportunities in your field that also look great on your CV. Master classes and recitals at universities are key to building your regional and national profile. Chamber music tours do the same thing as master classes and solo recitals, and show off your ensemble playing. Build a large private studio, if possible. This shows you’re a well-known and active member of the local musical community, and that you can bring in students. Show growth in your adjunct applied studio (if you have one). This looks great in job interviews for a tenure track position. Schedule recitals, even if they are only for the purpose of recording them. It is increasingly common for applications to ask for live, unedited recordings, and you can build up a reserve of excellent live performances to choose from. Video recording preferred; it is much more difficult to edit and is thus more trustworthy. Use Youtube – it will show what state the viewer is in when they watch your video! So helpful, and so creepy. Find smart people with experience on committees who will critique your materials, and take their advice. Think big! Express your vision of what you would bring to their program, and what you are working toward. Show confidence and collegiality when you speak. Learn to communicate your ideas clearly and efficiently. Let your best self shine through. This is key. Your teachers and mentors are plugged into the world you are trying to join, so check in every once in a while. If you nurture good relationships with your mentors, they can help you find opportunities. When you feel depleted, recharge with things that inspire you. We watch Sarah Willis conduct interviews with amazing musicians in Horn Hangouts, listen to encouraging podcasts that get us fired up, and look to our friends, who are out in the world doing incredible work. If they can do it, so can we. Finding stable work in this career takes a ton of time and effort. If you stick with it, and consistently work to improve yourself and your CV, you can make it happen. The people in your professional network can be great help in your job hunt. Committees may ask your colleagues, friends, and acquaintances about you, and you can make those unofficial inquiries positive and productive. Believe in the follow-up email. Networking is about making friends and helping each other, and when done well, is about genuine reciprocity and respect. Conference presentations and articles published in academic journals are another way to build your profile and establish yourself in your field. What can you learn form the winning candidate’s biography? 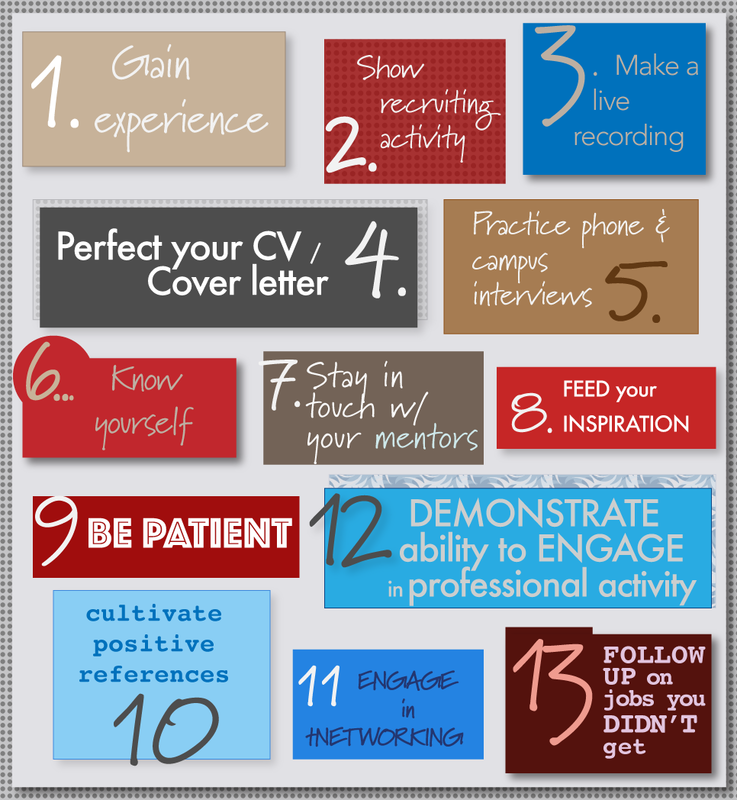 How can you make yourself the best candidate for the next job? Jacqueline Wilson is Assistant Professor of Music at Southeast Missouri State University where she teaches applied double reeds as well as courses in musicology and ethnomusicology. As an active bassoon soloist, she regularly presents recitals, masterclasses and clinics including recent engagements at the International Double Reed Society Conference (Redlands, California), the College Music Society Great Plains Conference (Vermillion, South Dakota), the Red Earth Native American Cultural Festival (Oklahoma City, Oklahoma), the Michigan Music Conference (Grand Rapids, Michigan), the Iowa Music Educators Association Conference (Ames, Iowa) and Wisconsin Public Radio’s program, Live From the Chazen. As an active chamber musician and founding member of both the Wilson Duo (bassoon and marimba) and the Driftless Winds reed trio, she has been featured on various college campuses and festivals, including the Ashland Chamber Music Society (Ashland, Wisconsin) and the Avaloch Chamber Music Institute (Boscowen, New Hampshire). 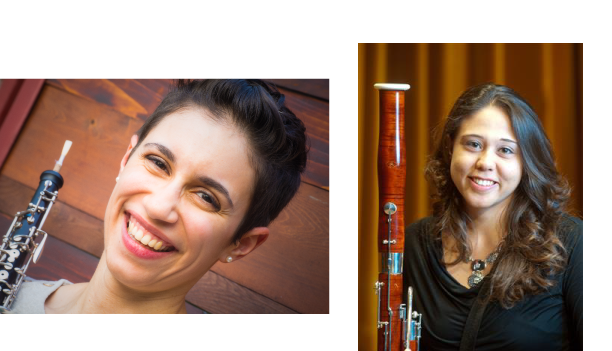 Dr. Wilson is an enthusiastic pedagogue who has taught at the University of Wisconsin-Eau Claire, the University of Wisconsin-Platteville, Kirkwood Community College and the Boston University Tanglewood Institute Bassoon Workshop. She has published educational articles in several journals, including The Double Reed, The Instrumentalist and School Band and Orchestra Magazine. Dr. Wilson has performed with multiple ensembles including the Waterloo-Cedar Falls Symphony, the Dubuque Symphony Orchestra, the Eau Claire Chamber Orchestra and the Chippewa Valley Symphony Orchestra. As an avid supporter of new music, Dr. Wilson has premiered and commissioned works by composers Jonathan Middleton, Brian Van Winkle, Anthony Donofrio and David Sumner. Her dissertation, a performance guide and analysis of the Concerto for Bassoon and Low Strings by Sofia Gubaidulina, advocates for the integration of modern repertoire into the standard pedagogical curriculum. Dr. Wilson (Yakama) is especially passionate about American Indian representation in classical music and frequently performs the works of Native composers. Dr. Wilson holds a Doctor of Musical Arts in bassoon performance and pedagogy from the University of Iowa. She is also a graduate of Boston University’s College of Fine Arts and Eastern Washington University. Her principal teachers include Benjamin Coelho, Matthew Ruggiero and Lynne Feller-Marshall. Oboist Galit Kaunitz is the Assistant Professor of Oboe at The University of Southern Mississippi, joining the faculty in the fall of 2015. At Southern Miss, she teaches applied oboe and Success for Music Majors, a class designed to ready new students for the demands of college, and to navigate their careers beyond graduation. Additionally, she performs with Category 5, the faculty wind quintet. Before joining the faculty, Dr. Kaunitz taught oboe at the University of Wisconsin-Platteville, where she often performed with Driftless Winds, UW-Platteville’s faculty reed trio. Together, Driftless Winds performed a Midwestern tour of the University of Wisconsin-Green Bay, Blackhawk College, Western Michigan University, Iowa State University, and the University of Northern Iowa in the 2014-2015 season. In the summer of 2015, Driftless Winds also completed a week long residency at the Avaloch Farm Music Institute in Boscawen, New Hampshire that involved learning newly-composed repertoire for wind trio. To mark her 2013 international debut, Dr. Kaunitz, as a member of the Coreopsis Quintet, was selected to give a performance and master class tour of Costa Rica as part of Centro Cultural’s Promising Artists of the 21st Century Program. Her orchestral career includes performances with the Charleston Symphony, Dubuque Symphony, Tallahassee Symphony, Southwest Florida Symphony, and Sinfonia Gulf Coast. Dr. Kaunitz earned her D.M. from The Florida State University with a Certificate in College Teaching, M.M. from The University of Texas at Austin, and B.M. from The Hartt School of Music. Her major teachers include Dr. Eric Ohlsson, Rebecca Henderson, and Humbert Lucarelli.